While Panhandle ISD has been a high-achieving school system for years – earning “A” ratings from the state time and time again – Rawlins became troubled by some “red flags” he saw in the school’s data. For example, he noticed an increase in the number of students being referred for dyslexia assessments. Over the course of a year, he also noticed that his school’s overall reading comprehension scores weren’t growing. Were the two trends related? Which one was more critical? Was Panhandle facing a dyslexia problem or an instruction problem? Rawlins understood that the way he framed the problem would determine the course of action his team would take. Rawlins and his staff had theories about what was happening with their students, but he wanted to look at the data to help inform their actions. “The 11th Commandment is: Thou shalt not kid thyself,” said Rawlins. 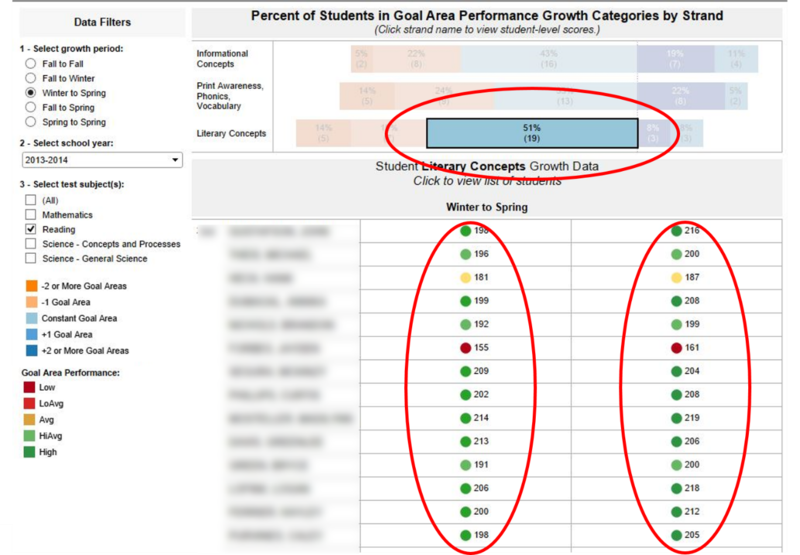 Using Schoolzilla, Rawlins dug into his students’ performance on the NWEA MAP, a widely used benchmark assessment given three times per year. 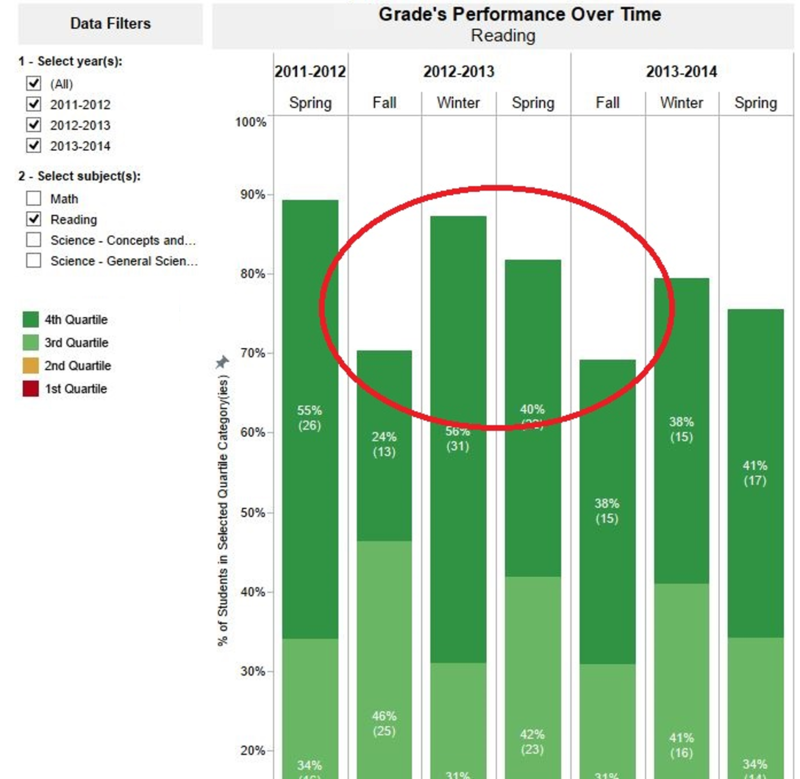 He reviewed performance over time by subject and by grade level. 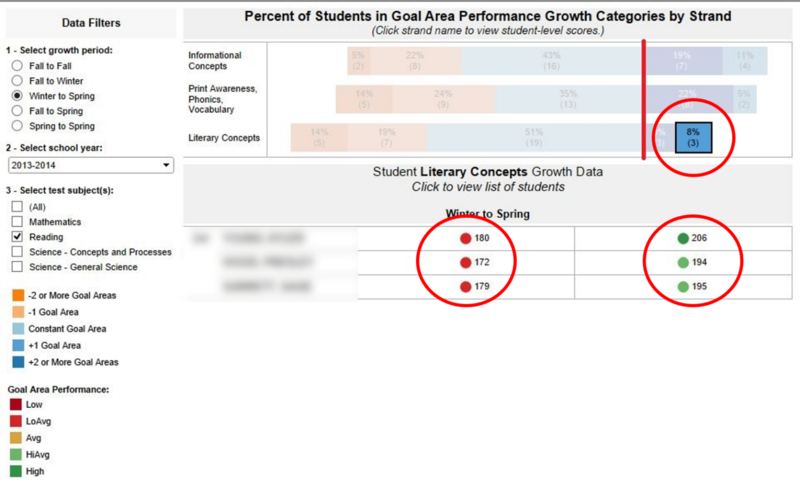 Picture 1 shows reading performance over time for a particular group of students at Panhandle Elementary School. (In the picture, grade level is not specified to protect student privacy.) Specifically, Picture 1 shows the Panhandle students who performed in the top two quartiles of all students in the same grade who took the NWEA MAP Reading Assessment at those times. The trend that bothered Rawlins was the “staircase effect” that he noticed from fall to fall (circled in red). Not only could he clearly see the effects of summer learning loss (the typical dip in test scores from spring to fall), but he also noticed that his top students’ performance was peaking in the winter rather than the spring. Why were his top students losing ground midyear? Was this trend true for all students? Rawlins next set out to diagnose the growth problem. He examined the scores and growth trends of specific students using the report in Picture 2. This report groups students by the amount of growth they make between testing intervals. School leaders can drill down into each growth group to see individual students and their scores at each time of testing. Compare Picture 2 to Picture 3. You can see in Picture 3 that students with the lowest scores in the winter had the most growth by the spring assessment. This contrast – high growth for the lowest performers versus low growth for the highest performers – led Rawlins to a revelation: Panhandle’s reading instruction tended to teach to the bottom. To deepen the analysis, Picture 4 shows that the majority of students in this particular grade have decent scores and middling growth. When Panhandle’s staff sat down to think about why reading scores might have suffered from winter to spring, they realized that one change in particular might be at fault: the school had substantially diminished the number of hours that the library was kept open because of a personnel change. “It’s simple,” Rawlins said. “If the library’s closed, then the kids can’t read as much.” That was a relatively easy fix. Having uncovered this issue, Rawlins had a new perspective on the increasing rates of dyslexia referrals. “Anytime you have reading processing problems, it’s a huge umbrella. And dyslexia is just one red flag, one snippet,” said Rawlins. Data helped to confirm Rawlins’ hypothesis that Panhandle Elementary School’s performance trends had much more to do with multiple needs, especially for students that started out strong, than with an increase in the prevalence of dyslexia. The school also decided to send several teachers to a summer writing academy for professional development. Rawlins believes that reading can’t happen without writing and that his school should perhaps focus more on the mechanics of writing to reinforce their literacy instruction. “The bottom line,” says Rawlins, “is that the reason Panhandle has good scores, is because we have great teachers, dedicated to meeting the needs of all kids.” Schoolzilla is proud to be part of Panhandle’s instructional strategy.